When a struggle erupts to mass movement, the enemy camp suffers a great blow and subsequently collapse in toto. In physics, before there will be work done there must be distance and force, for distance to occur there should be speed and time. My focus here is “time”, drastic times requires drastic measures. Time management is one of the most difficult situations that we face in life, and when you can conquer timely responses, people began to think order wise maybe you are extraordinary human. I’m very happy with IPOB timely battle formations; like players in football peach they play 4:3:3 when the zoological Republic of Nigeria is playing 5:3:2 i.e. attacking and defensive respectively. 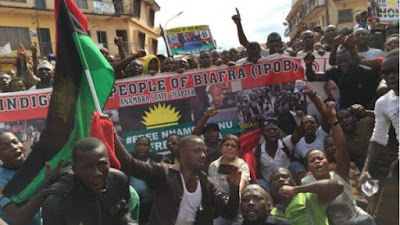 IPOB formation has set Nigerian government in disarray. For example, when they expected a street rally, IPOB said the sit-at-home rally, even on 14th October 2016 marking one year of Kanu's incarceration, they expected a rally and IPOB said no rally. I called the above scenario "being ahead of your enemies", unpredictability and having mystic colouration. The reason why some people are considered great is because they are ahead of their peers in all directions. They set the pace while others follow. In short, they are pace setters. As IPOB continues to surprise the whole world with their UN recognised unpredictable modus operandi towards Biafra restoration campaign, it is pertinent to acknowledge door-to-door campaign. Door-to-door in the words of Uche Mefor may be called “grassroots campaign”. Every street, compound and even rooms in Biafra land and beyond should establish IPOB family in guidelines of IPOB zonal coordinators and global family. Nigeria security personnel are relentless in their quest for crimes against humanity. Just on October 22nd, 2016 IPOB members was abducted in Bayelsa STATE during their prayer meeting and after all the inhuman treatments and torture melted on them, they were released on October 24th, 2016. Their quick release isn't unconnected with amnesty international’s IPOB invitation to a workshop on Saturday 29th October 2016 in USA. During the workshop, IPOB will be in their full gear, and there would be a greater awareness campaign of the barbaric government of Nigeria Hitler, Muhammadu Buhari. The blood sucking camp of Buhari's government is confused because IPOB is waxing very strong with speed of light. And the only thing that will stop IPOB movement is the day Biafra flag will rise never to come down. IPOB keep on keeping on with your battle formation. With satellite circulation projects you are to start all over Biafra land and door-to-door campaign, you have put the last nail in Nigeria’s coffin.